In the past, I’ve been resistant to the idea of twice baked, stuffed potatoes. Isn’t that an awful lot of work for baked potatoes? Couldn’t I just mash up the filling with a fork once it’s done, then add some Earth Balance or something? Is baking twice really worth it? 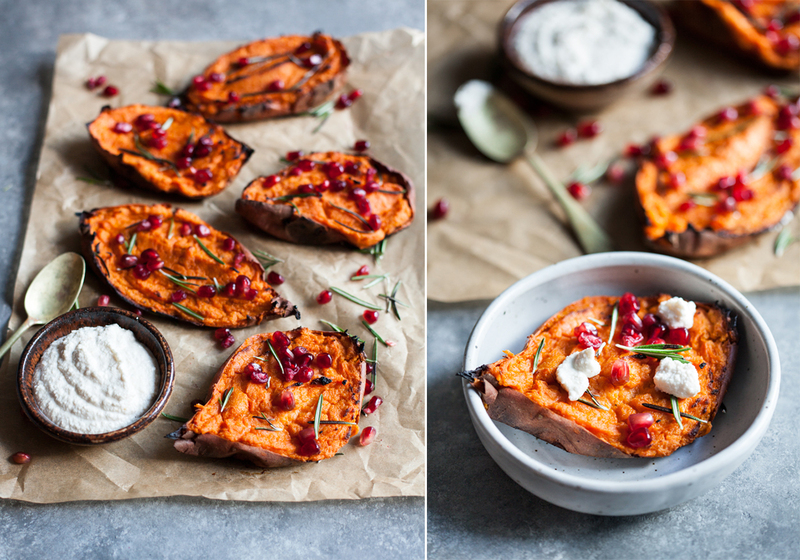 This recipe for twice baked, stuffed sweet potatoes with macadamia ricotta has proven to me that it is so very worth it. The creamy texture of the potatoes, enhanced with a fluffy macadamia “ricotta,” coupled with the slight crispy topping that the second round of baking provides, is magical. I probably won’t bake my potatoes twice on a regular basis, but for a special occasion, this is my new favorite way to eat spuds. The recipe starts by baking potatoes as usual, allowing the insides to get nice and tender, then mashing them and folding them together with some light, homemade macadamia “ricotta.” If you’ve seen recipes for twice baked potatoes with goat cheese before, then consider this a vegan spin on that idea. 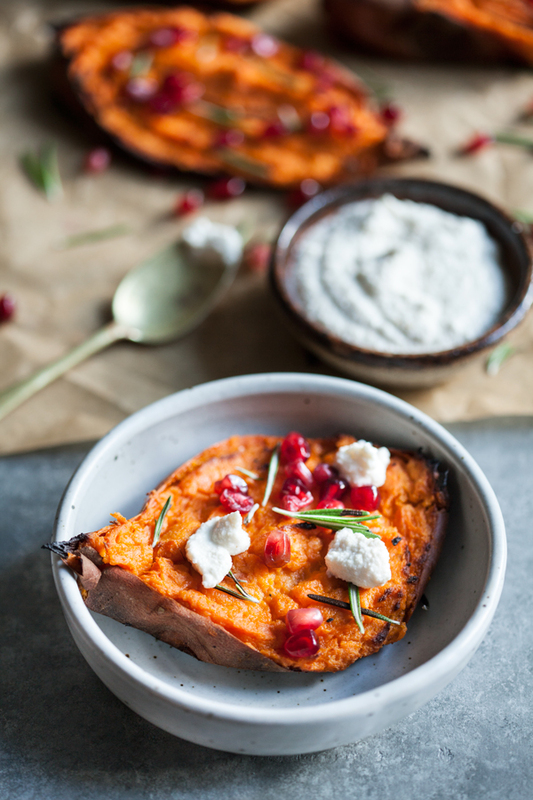 I’ve always thought that the combination of sweet potatoes and salty, soft cheese sounded wonderful, and now I have a plant-based version to savor. 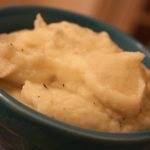 I like the filling of these potatoes because they’re an untraditional way to make sweet potato mash: typically I just use some non-dairy milk, some coconut oil or earth balance, and salt and pepper. The macadamia ricotta (which you can make with cashews instead, if you don’t have macadamias on hand) creates all of the creaminess and provides all of the fat you need in one fell swoop, and the filling of the potatoes takes on an almost whipped texture after you fold in the cheese. 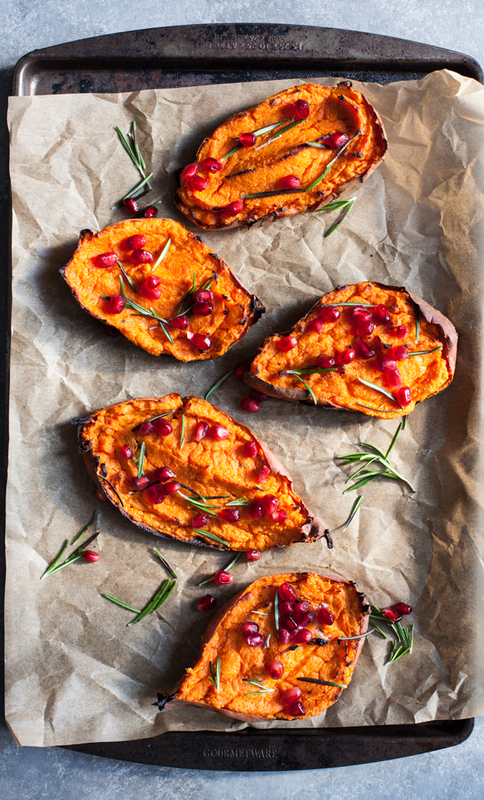 I add rosemary to this recipe for a little bit of extra savory flavor, and then top with pomegranate seeds for color and crunch. You can bake the potatoes with the herbs, or you can sprinkle fresh herbs on at the end for brighter flavor. The pomegranate seeds could be replaced with dried cranberries, if you like, and you can also dot the potatoes with a few extra dollops of the cheese for serving–I made sure to provide enough in the recipe that there’s a bit leftover for decorating, or for enjoying as leftovers. Preheat your oven to 400F. Prick the sweet potatoes with a fork a few times (about 3 pricks per potato). 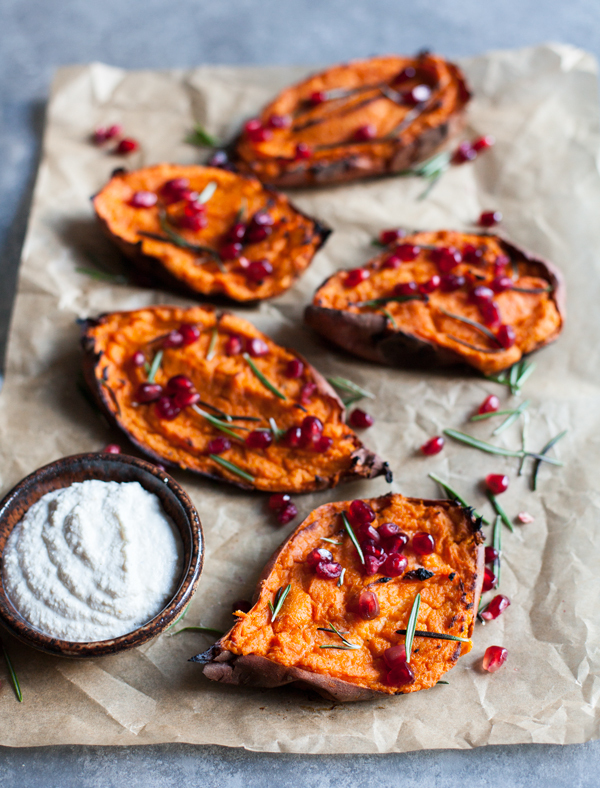 Place them on parchment or foil-lined baking sheets, and roast for 40 minutes, or until the potatoes are very tender. Reduce the oven heat to 350F. While the potatoes roast, prepare the ricotta. Place the macadamia nuts (or cashews) in a food processor fitted with the S blade. Add all remaining ingredients. Process until the mixture is creamy and smooth, stopping a few times to scrape the bowl down as you go. Once the mixture is very even in consistency, set it aside. 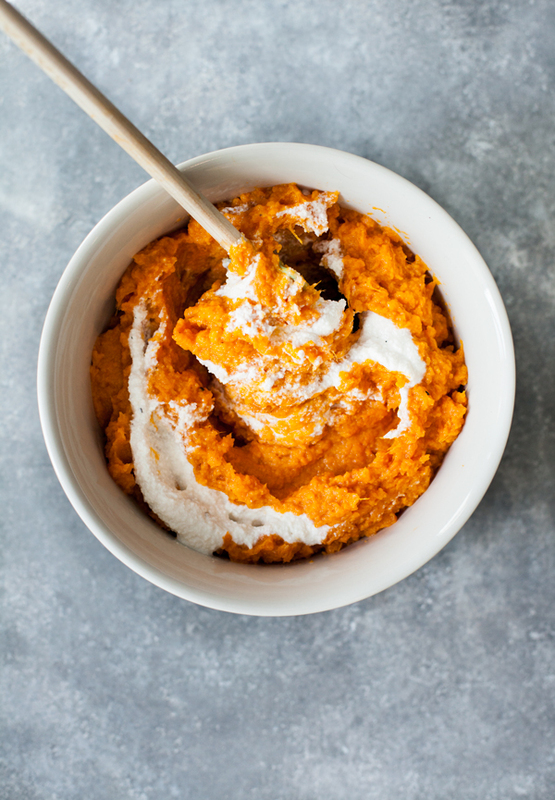 Very gently, so as not to damage the potato skins, scoop the sweet potato flesh out of the skins with a spoon and transfer it to a mixing bowl. Add the salt and pepper. Mash with a potato masher until the potatoes are mashed, but still thick and with some texture. Fold in ¾ cup of the macadamia ricotta, reserving a heaping quarter cup for garnish. Season the mashed potato mixture to taste, and scoop it back into the skins. Place the skins on freshly lined baking sheets. Sprinkle with rosemary (if you prefer fresh rosemary, garnish the potatoes with it after baking). Bake the potatoes for 20-25 minutes, or until lightly browning. Sprinkle the potatoes with the pomegranate seeds and dot them with the extra macadamia ricotta. Serve. Recipe can be halved to make fewer servings. Leftover potatoes will keep in an airtight container in the fridge for up to three days. Leftover macadamia ricotta will keep in an airtight container in the fridge for up to five days. 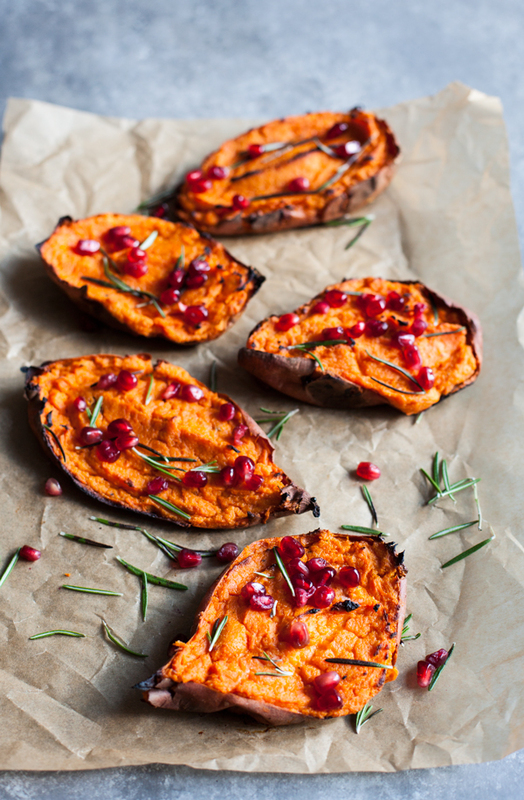 I never really met a sweet potato that I didn’t like, but I confess, this is one of my favorite new preparation methods. 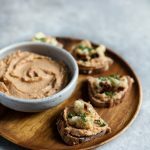 It’s a perfectly bright and colorful dish for the holidays, and if your friends and family have never experienced nut cheese before, this is a great, easy recipe to introduce them with. I always feel that homemade dairy substitutes beat store-bought ones by a mile, and macadamias create a lighter texture than do many other types of nuts. I hope you’ll give the recipe a try, and that you’ll let me know how it goes. This is a great one to add to your menu for Christmas, if you’re celebrating the holiday. Speaking of Christmas, this week is a little hectic with friends and family visiting from out of town. Once again, I’m winging it with my meal plan this week, cooking up a few batches of bean and grain staples, interspersed with holiday cooking. Because I’m not really sure what’ll come up between now and Friday, I’m not doing a formal Monday Menu Plan post, but I’ll be back at it next week. In the meantime, I’ve got another tasty holiday recipe for you tomorrow. See you soon. 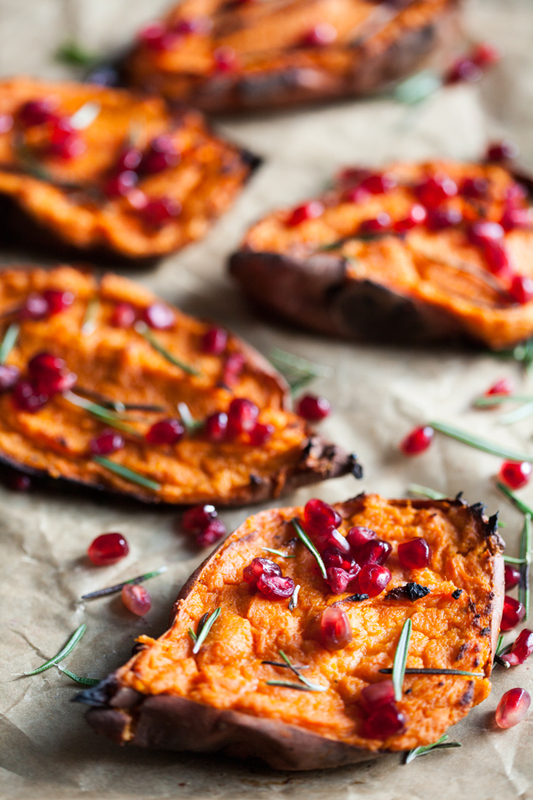 Wow, this is such a gorgeous recipe – great colors for the holidays and just about anything with sweet potato is awesome for me. Thanks! “I never really met a sweet potato that I didn’t like” Gena, you took the words right out of my mouth! 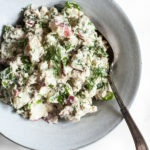 I’ll have to skip the macadamia ricotta (nut allergy) but I will definitely be giving this a try. this a great recipe i love to eat it.